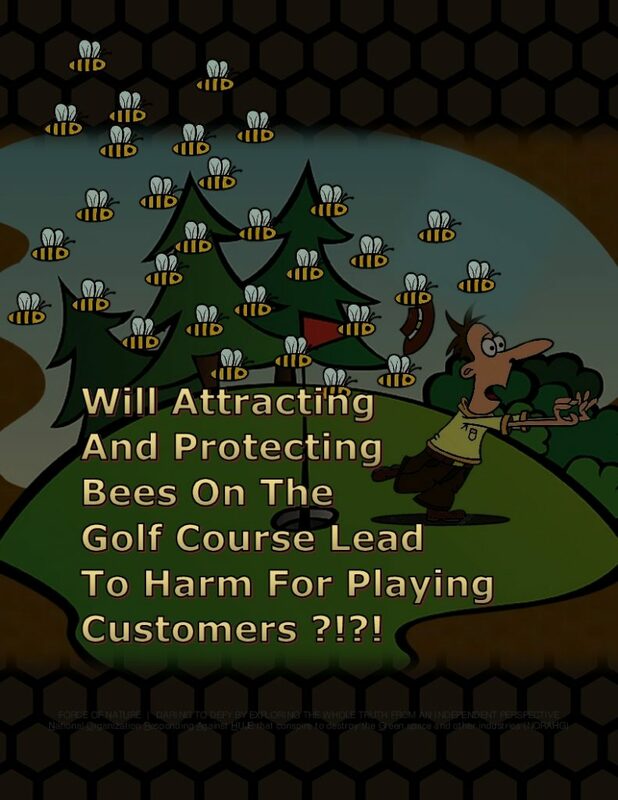 Question ― Will attracting and protecting bees on the golf course lead to harm for playing customers ?!?! By adopting so-called Pollinator Best Management Practices, some superintendents have decided to install and maintain bee-hives on their golf courses. Bee-hives on the golf course represent a danger for playing customers. Bee-hives attract killer bees. Bees represent a clear and present danger to playing customers. The owners of golf facilities should NEVER allow superintendents to install and manage ANY bee-hives on the golf course. Bee-hives attract bees that can harm, and possibly even kill, people. They attract killer bees. What if young golfers and adults get stung ?!?! What if they happen to be allergic to bee stings ?!?! A sting may trigger a dangerous anaphylactic reaction that is potentially deadly. Stings will also release pheromones that prompt other nearby bees to attack. The owners of golf facilities will inevitably have their brains’ sued out ! There should be NO bee-hives on the golf course ! Question ― Are Pollinator Best Management Practices radical ?!?! Bee conspiracy fanatжcs and their tactics of coercion and intimidation, as well as their penchant for being truth-challenged, may have rendered Pollinator Best Management Practices as radical, as well as ineffective & harmful. 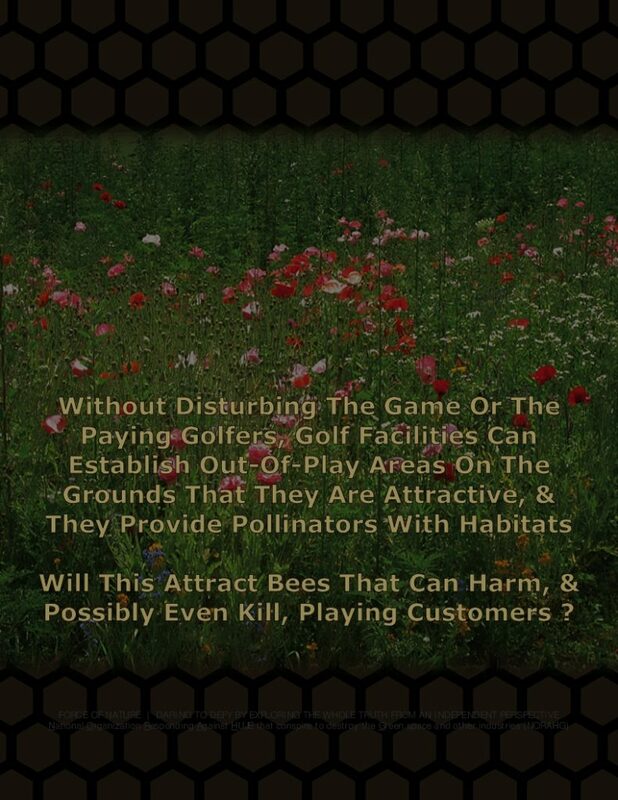 Question ― How are superintendents being coerced and intimidated into attracting and protecting bees on the golf course ?!?! Bee-keepers, and all other radical bee conspiracy fanatжcs, have begun to convince the golf industry’s researchers and educators that Pollinator Best Management Practices ( PBMP ) should be adopted by the golf industry. 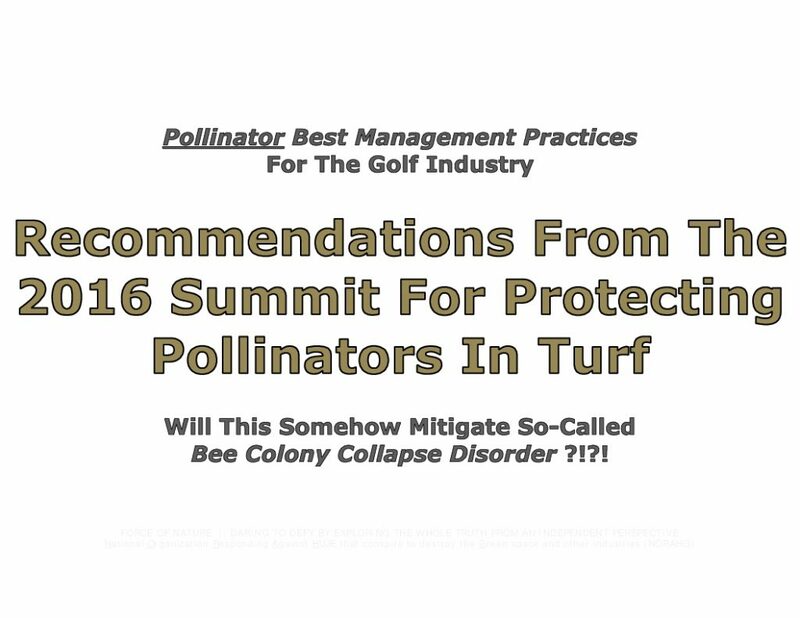 One example of PBMP includes Recommendations From The 2016 Summit For Protecting Pollinators In Turf. Strangely, most of the recommendations have been derived from the work of a single person, Dr Daniel A Potter, Department of Entomology, University of Kentucky. See later segment entitled Literature Cited. The basis for recommending these practices appears to originate from a fake-news story about a mere 200 bees that supposedly died under some linden trees in a Target Store Parking Lot in the State of Oregon in 2013. See later segment entitled The Fake-News Target Store Parking Lot Incident In Oregon. 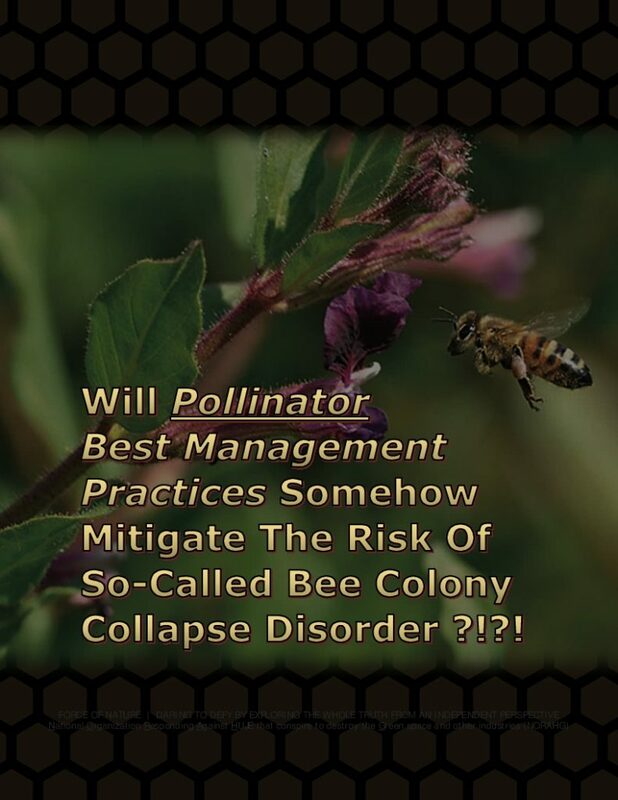 Question ― Are Pollinator Best Management Practices effective ?!?! Bee-keeping-superintendents seem to have a lot of time to waste. Clearly, if a superintendent can devote considerable time to the installation and maintenance of bee-hives, then it is abundantly clear that his employers should insist that the time can be better spent on what playing customers really care about … high-quality playing conditions and aesthetics. A superintendent is paid to satisfy the demands of playing customers, and NOT bee-keepers. A superintendent works in the golf industry, and NOT the bee-keeping industry. Bee-keeping is NOT an effective use of his ⁄ her time & energy. There should be NO bee-hives on the golf course ! Question ― What are more effective uses of the superintendents time ?!?! There are more important critical issues that the golf superintendent must address ― now ! Forget about bee-hives. The golf industry’s superintendents must recognize that they are on a collision course with the looming shipwreck of golf-hating and anti-pesticide terrжism ! Superintendents face some huge challenges because of their high degree of vulnerability concerning several public affairs issues. In order to successfully deter the malicious efforts of all fanatжcal golf-hating anti-pesticide terrжrists, the golf industry must immediately address several critical issues. Explore the link below entitled Critical Issues For The Golf Industry. Question ― If golf courses reduce their use of pest control products, then will some bee-keepers stop losing bees over and over and over again ?!?! 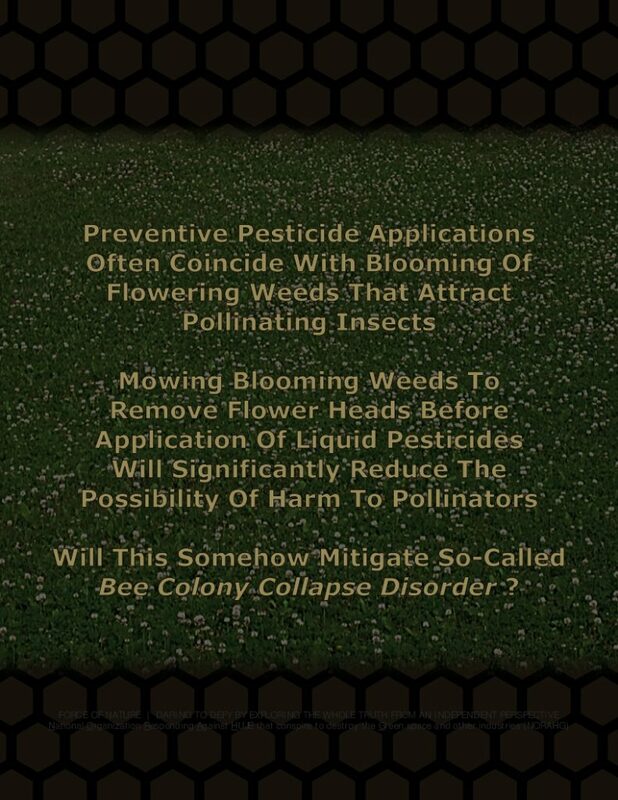 So-called Bee Colony Collapse Disorder ( BCCD ) caused by golf courses is a MYTH ! There is NO unambiguous evidence to suggest that neonicotinoid insecticides are to blame for BCCD. Under normal use, these insecticides DO NOT pose a problem to bees. There is NO neonicotinoid crisis ! Question ― If Pollinator Best Management Practices are radical, ineffective, & harmful, should they be adopted by the golf industry ?!?! Incredibly, over-worked and under-paid superintendents are now expected to adopt yet another set of practices. And, they are also expected to attract and protect bees on their golf courses. And, these superintendents are required to mitigate potential risks of so-called Bee Colony Collapse Disorder ( BCCD ). This does not seem fair in view of the fact that there is NO proof of harm to bees by golf course products, especially neonicotinoids. If some bee-keepers are losing bees over and over and over again, it is THEIR problem. BCDD caused by the use of insecticides is a MYTH perpetuated by radical bee conspiracy fanatжcs ! Neonicotinoid insecticides are desperately needed by the golf industry for the safe, effective, and economical control of insects that damage turfgrasses. On the golf course, reducing the use for fungicides, herbicides, and insecticides will have absolutely NO effect on bees ― including neonicotinoids. Moreover, there is NO PROOF that these products will harm honeybee colonies when they are used properly. Scientists, under the direction of the famed Dr Keith Ross Solomon, at the University of Guelph, have reported that there are NO studies that show that neonicotinoids have harmed honeybee colonies. Scientists found that while these insecticides can harm individual honeybees, there is NO EVIDENCE linking them to the losses of a few bee-keepers in recent years. Explore the link below entitled There Is NO Proof That Neonicotinoid Harm Honeybee Colonies When Used Properly — Dr Keith Ross Solomon. In other words, when correctly-used, neonicotinoid insecticides DO NOT adversely affect honeybee colonies. The use of these neonicotinoids, with good practices, DOES NOT present a risk to honeybees at the level of the colony. Consequently, neonicotinoids are NOT A MAJOR CONCERN for honeybees. Question ― Why are just a few bee-keepers losing their bees ?!?! Some bee-keepers are killing their own bees over and over and over again. The most likely cause of losses are the bee-keepers themselves. INCOMPETENT bee-keepers are killing their own hives. Observers have concluded that many bee-keepers have NO IDEA what they are doing, and are simply NOT SKILLED to raise bees. Otherwise, bees are GROWING and THRIVING. Bees are NOT being lost because of the agricultural or golf course use of insecticides. Explore the links below entitled Bee-Keepers Are Harming Bees, & NOT Neonicotinoid Insecticides. Bee-keeping-superintendents are also expected to be UNSKILLED and INCOMPETENT. Raising bees is NOT within their field of expertise. Moreover, even if just a few bees are lost due to superintendent INCOMPETENCE, bee conspiracy fanatics will, predictably, blame the use of pest control products. There should be NO bee-hives on the golf course ! Question ― Should superintendents co-operate with local bee-keepers ?!?! If golf superintendents become forced to learn bee-keeping, then they will need to seek advice from local bee-keepers. This is a BAD IDEA, especially if they are members of the renegade Ontario Bee-Keepers’ Association ( OBA ). The owners of golf facilities should NEVER allow their superintendents to forge ANY relationship with bee-keepers, who can be expected to abuse their relationship with the golf industry in order to impose reckless and arbitrary prohibition against neonicotinoid insecticides. With unsubstantiated stories and imaginary danger, bee-keepers are demanding that ALL uses of these insecticides must be stopped. This demand is being made under the pretext of somehow mitigating so-called Bee Colony Collapse Disorder ( BCCD ). Superintendents must stay away from bee-keepers and all other radical bee conspiracy fanatжcs. 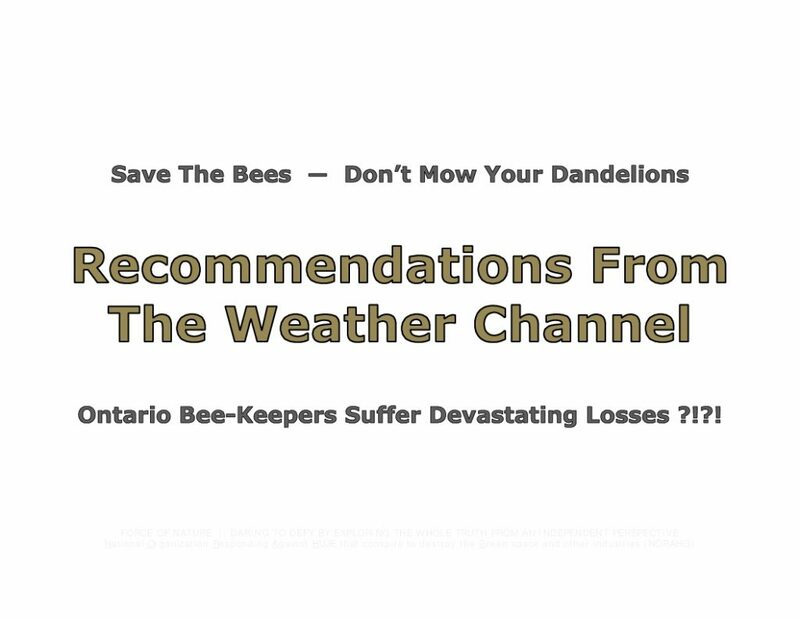 Explore the link below entitled Ontario Bee-Keepers’ Association ( OBA ) — a.k.a. Sierra Club — Renegade, Lunatжc, Destructive, Reckless, & Subversive. Pesticides ― including fungicides, herbicides, insecticides, and plant growth regulators ― are valuable tools that allow the turfgrass industry to provide the high-quality turf that the public demands. In order to preserve, and protect these valuable tools, the turfgrass industry must use them correctly ― in accordance with pesticide labels, EPA guidelines, and university recommendations. Often, the [ FALSE ] PUBLIC PERCEPTION that use of these control agents is linked to pollinator decline threatens future use of these tools, and our ability to maintain functional, high-quality turf. The [ FALSE ] PUBLIC PERCEPTION that pesticides are the primary factor responsible for pollinator decline has already resulted in the PHASE-OUT [ i.e. reckless & arbitrary prohibition of certain neonicotinoid ] insecticides for turfgrass use. Golf superintendents are responsible for satisfying playing customers and their demands for high-quality playing conditions and aesthetics. They are NOT responsible for the problems of the bee industry. Perhaps it is time for the golf industry’s researchers and educators to stop wasting everyone’s time on Pollinator Best Management Practices ( PBMP ). Instead, they should be defending the golf industry. They should be defying the FALSE PUBLIC PERCEPTION that pest control products are somehow harming bees. Why are the golf industry’s researchers and educators remaining silent ?!?! Why are they not defending the industry ?!?! The bees are actually GROWING AND THRIVING. Bee populations are NOT being threatened, and are doing just fine ! There is NO neonicotinoid crisis ! See the later segment entitled Honeybee Colonies & Production Are Thriving. Extension, and research entomologists from across the United States met in at The 2016 Summit For Protecting Pollinators In Turf to review the scientific literature on non-target impacts of pest management practices on pollinators in the turfgrass landscape, with the goal of developing Pollinator Best Management Practices ( PBMP ) to protect pollinators, identify knowledge gaps, and prioritize future research needs. The working group identified the LIMITED RESEARCH that exists in turf landscapes, and prioritized areas where research is needed to conserve pollinators while balancing the needs for maintaining healthy, high-quality turfgrass. Synthetic pesticides ― including fungicides, herbicides, insecticides, and plant growth regulators ― are important tools in managing turf landscapes. Why are the golf industry’s researchers and educators not defending the industry ?!?! 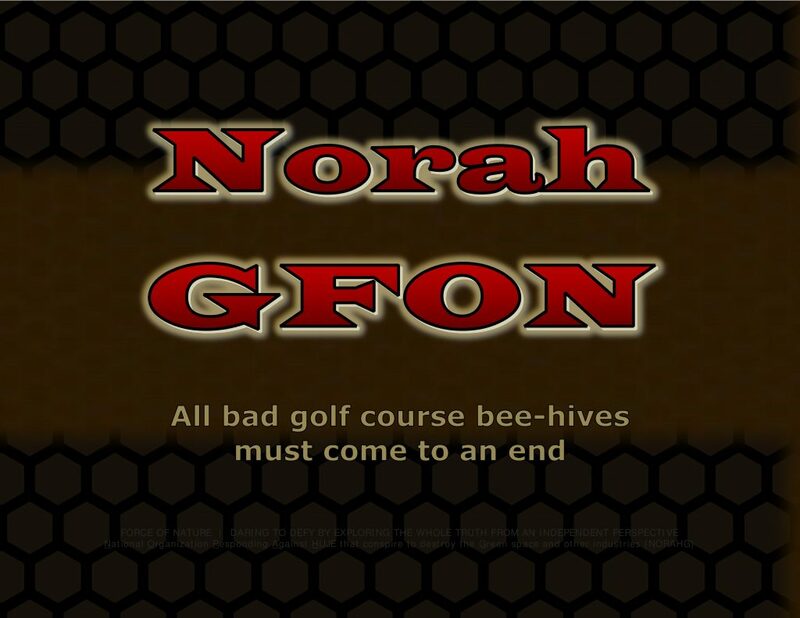 The golf industry is NOT responsible for the problems of the bee industry. Nevertheless, the bees are actually GROWING AND THRIVING. Bee populations are NOT being threatened, and are doing just fine ! There is NO neonicotinoid crisis ! Will This Somehow Mitigate The Risk Of So-Called Bee Colony Collapse Disorder ?!?! The ecological services that native, and managed bees, and other pollinating insects provide to society are invaluable. This NEGATIVE PERCEPTION has contributed to the IMPOSITION OF BANS against the use of neonicotinoids for aesthetic purposes ( including turfgrass management ) by several municipalities in the United States. These BANS illustrate the need for the development of rational, science-based recommendations for Pollinator Best Management Practices that promote healthy turf while conserving, and enhancing pollinator health. Who cares about pollinator health ?!?! Golf superintendents are NOT responsible for the problems of the bee industry. Over-worked and under-paid superintendents are now expected to adopt radical, ineffective, & harmful Pollinator Best Management Practices that will DO NOTHING for pollinator health. The alleged losses of bees are, in fact, the fault of bee-keepers and their mis-management practices. They are KILLING their own bees, and they appear to be unable or unwilling to mitigate the real issues that harm bees, such as starvation, transportation, weak colonies, fungal infections, and mite infestations. These issues have NOTHING TO DO with golf course superintendents. Are [ Somehow ] Imperative For Protecting Pollinators ?!?! Turfgrass managers can employ similar principles to mitigate potential [ IMAGINED ] risks to pollinators. Over-worked and under-paid superintendents were expected to adopt Integrated Pest Management ( IPM ) practices because of the imagined risk of pesticide. Now, they must adopt yet another set of practices, Pollinator Best Management Practices ( PBMP ), to minimize the imagined risk of golf courses to bees. IPM practices were ⁄ are failures because they DO NOT WORK. PBMP will be failures because they WILL NOT WORK either. Bees will NOT be protected by PBMP because there are NO real risks on the golf course. Sadly, IPM and PBMP are promoted by the golf industry’s researchers and educators who falsely allege their success, and who are likely concocting lies, misconceptions, and deceptions for their own nefarious personal interests. They do not care about forever burdening superintendents with practices that were ⁄ are radical, ineffective, harmful, expensive, and time-consuming. Who cares about these researchers and educators ?!?! Overall, IPM and PBMP are wastes of time and money for golf courses. It is impossible for golf superintendents to ensure high-quality playing conditions and aesthetics by using IPM and PBMP. See the later segment entitled IPM Is #@! !% Futile Nonsense. First, and foremost, merely FOLLOWING THE PESTICIDE LABEL, and ensuring that pollinators are NOT directly exposed to pesticide residues can minimize potential negative impact to pollinators. Who cares about pollinators ?!?! Golf superintendents are NOT responsible for the problems of the bee industry. They are now being HORRIFICALLY FINED whenever they defy the label directions for pest control products. Traditionally, fines have been levied against the golf facility business, and NOT against the employee-superintendent. No more ! HORRIFIC FINES are now being imposed specifically against the superintendents themselves. See the later segment entitled Educating Golf Course Superintendents. Is this fake-news story the basis for recommending radical, ineffective, & harmful Pollinator Best Management Practices ?!?! Is it possible that the linden trees themselves were toxic to the bumblebees ?!?! See the later segment entitled The Fake-News Target Store Parking Lot Incident In Oregon. Who cares about 50,000 bee losses in Oregon ?!?! Bee-keepers decimate millions and millions and millions of their own bees by driving their transport vehicles INEPTLY ! There IS a commercial honeybee crisis because of the carnage caused by their truck accidents. Up to 20 million honeybees have died in a single truck accident ! 20 million bee deaths is the largest bee kill on record by INEPT bee-keeper drivers ! See the later segment entitled The Biggest Killer Of Honeybees. Consequently, where turfgrass weeds are mowed regularly, the application of pesticides ( including neonicotinoids ) DOES NOT pose a prolonged systemic hazard to bees. Turfgrass managers should be mindful of the timing of pesticide applications. Timing can determine the likelihood of pollinator exposure to pesticides, especially insecticides. Unfortunately, such preventive application timings coincide with the blooming of flowering weeds that frequently attract numerous species of pollinating insects. Simply DELAYING [ FOR HOW LONG ?!?! ] the application of pesticides ( insecticides ) while small, and vulnerable colonies of honey bees, and bumble bees are recovering from winter stress can dramatically reduce the likelihood of potential exposure to toxic insecticides. Turfgrass managers can also minimize the potential [ IMAGINED ] risk of pesticide exposure to pollinators by applying pesticides only in the EARLY MORNING or EARLY EVENING, when most pollinator species are NOT actively foraging. These Pollinator Best Management Practices are NOT FAIR in view of the fact that there is NO proof of harm to bees by golf course products, especially neonicotinoids. Nonetheless, over-worked and under-paid superintendents are now expected to adopt yet another set of practices to minimize the imagined risk of golf courses to bees. And, they are also expected to protect bees on their golf courses when the bee-keepers themselves are known to be the BIGGEST KILLERS of bees. See the later segment entitled Bee-Keeper Madness. A research study compared sprayable with granular formulations of neonicotinoids when both were applied to flowering weeds in turf. Although both the liquid, and granular products are systemic, the granular formulation is LESS LIKELY to contaminate flowering portions of blooming plants. Product labels often require POST-TREATMENT IRRIGATION, especially for management of below-ground insects such as white grubs. I extend my appreciation to Adam Dale, University of Florida; David Held, Auburn University; Johnathan Larson, University of Nebraska; Ben McGraw, Penn State University; Doug Richmond, Purdue University;, and Kyle Wickings, Cornell University, for their contributions to, and authorship of the manuscript ( Larson et al, 2017 ) on which this article is based. I also thank all the attendees of The 2016 Summit For Protecting Pollinators In Turf in Sheboygan, Wisconsin. Dr R Chris Williamson is a professor and extension specialist at the University of Wisconsin-Madison. Who pays these guys to travel long-distances to Summits For Protecting Pollinators In Turf and other nonsensical events ?!?! Directly or indirectly, the golf industry pays these guys who, for all intents and purposes, come up with anti-golf practices that are radical, ineffective, harmful, expensive, and time-consuming. They should be defying the FALSE PUBLIC PERCEPTION that pest control products are somehow harming bees. They should forget about concocting a never-ending litany of pointless practices. Otherwise, who cares about these over-paid researchers and educators with bloated travel budgets and lavish life-styles ?!?! They should have more stringent industry oversight. Let’s worry about REAL issues that affect superintendents. • The causes of pollinator decline are numerous, and public opinion often [ WRONGLY ] places the blame on insecticides. • Applying pesticides according to label instructions, and in accordance with EPA guidelines, and university recommendations will help protect pollinators, and the environment. Pollinator Best Management Practices ( PBMP ) will be failures because they WILL NOT WORK. Bees WILL NOT be protected by PBMP because there are NO real risks on the golf course. Sadly, IPM and PBMP are promoted by the golf industry’s researchers and educators who falsely allege their success, and who are likely concocting lies, misconceptions, and deceptions for their own nefarious personal interests. Most of the recommendations from The 2016 Summit For Protecting Pollinators In Turf have been derived from the work of a single person, Dr Daniel A Potter, Department of Entomology, University of Kentucky. ( 1 ) Bayer Environmental Science. 2012. Canadian Merit Label. ( 2 ) Gels, J.A., D.W. Held, & D.A. Potter. 2002. Hazards Of Insecticides To Bumble Bees, Bombus Impatiens ( Hymenoptera: Apidae ) Foraging On White Clover In Turf. Journal Of Economic Entomology 95:722-728. ( 3 ) Goulson, D., E. Nicholls, C. Botias, & E.L. Rotheray. 2015. Bee Declines Driven By Combined Stress From Parasites, Pesticides, & Lack Of Flowers. Science 347:1255957. ( 4 ) Held, D.W., & D.A. Potter. 2012. Prospects For Managing Turfgrass Pests With Reduced Chemical Inputs. Annual Review Of Entomology 57:329-354. ( 5 ) Klein, A.M., B.E. Vassiere, J.H. Cane, I. Steffan-Dewenter, S.A. Cunningham, C. Kremen, & T. Tscharntke. 2007. Importance Of Pollinators In Changing Landscapes For World Crops. Proceedings Of The Royal Society : Biological Sciences 274:303-313. ( 6 ) Kunkel, B.A., D.W. Held, & D.A. Potter. 2001. Lethal, & Sublethal Effects Of Bendiocarb, Halofenozide, & Imidacloprid On Harpalus Pennsylvanicus ( Coleoptera: Carabidae ) Following Different Modes Of Exposure In Turfgrass. Journal Of Economic Entomology 94:60-67. ( 7 ) Larson, J.L., A.J. Keisheimer, & D.A. Potter. 2014. Pollinator Assemblages On Dandelions, & White Clover On Urban, & Suburban Lawns. Journal Of Insect Conservation 18(5):863-873. ( 8 ) Larson, J.L., C.T. Redmond, & D.A. Potter. 2015. Mowing Mitigates Bioactivity Of Neonicotinoid Insecticides In Nectar Of Flowering Lawn Weeds, & Turfgrass Guttation. Environmental Toxicology, & Chemistry 34:127-132. ( 9 ) Milesi, C., C.D. Elvidge, J.B. Dietz, B.T. Tuttle, R.R. Nemani, & S.W. Running. 2005. Mapping, & Modeling Of Biogeochemical Cycling Of Turfgrasses In The United States. Environmental Management 36:426-438. ( 10 ) Mohney, G. 2013. More Than 25,000 Bees Die In Oregon. Accessed April 2, 2018. ( 11 ) Stark, J.D., P.C. Jepson, & D.F. Mayer. 1995. Limitations To Use Of Topical Toxicity Data For Predictions Of Pesticide Side Effects In The Field. Journal Of Economic Entomology 88:1081-1088. Bee-keepers, and other radical bee conspiracy fanatжcs, have infested The Weather Channel, which recommends radical & ineffective Pollinator Best Management Practices ( PBMP ) for home-owners. 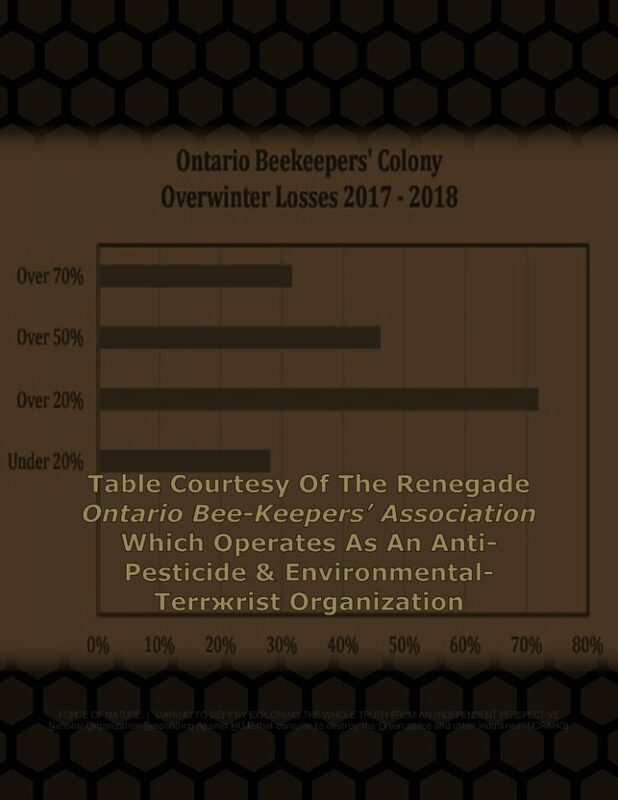 Because Ontario bee-keepers are alleging extreme losses yet again in 2018 ― possibly the worst winter loss on record [ ?!?! ] . I’ve been getting calls from [ INCOMPETENT ] bee-keepers around the province. When bee-keepers lose more than 20 per cent of their colonies, they can have a rough time building things back up. They’ll have to spend money on new bees and will spend a majority of the summer rehabilitating their colonies, ultimately losing money in the process. One in four bee-keepers [ UNVERIFIABLY ] have reported to the OBA that if these losses continue, they will not be able to continue bee-keeping. Perhaps these bee-keepers, who are suffering devastating losses over and over and over again, SHOULD stop raising bees. Clearly, these bee-keepers are INCOMPETENT. Fortunately, just a few bee-keepers are actually losing their bees. They have no idea what they are doing, and are simply NOT SKILLED to raise bees. Otherwise, bees are actually GROWING AND THRIVING. Bee populations are NOT being threatened, and are doing just fine ! See the later segments entitled Bee-Keeper Madness and Honeybee Colonies & Production Are Thriving. Fortunately, NOT ALL COLONIES HAVE FACED LOSSES. Mr Shaun Hensher, a [ COMPETENT ] bee-keeper from the Orillia area, said all of his bees are DOING JUST FINE. I’ve seen a lot of reports of other bee-keepers having massive losses, so I’m grateful we had such luck. Losses are to be expected … [ but ] some bee-keepers who were already struggling due to low honey prices and repeated years of losses may have to shut down their operations. This is bad news not only for the individual bee-keepers, but for the entire bee population. Native pollinator populations are rapidly declining [ ?!?! ] , and if bee-keeping becomes untenable as an industry, we will lose the crucial pollinating services that honeybees provide [ ?!?! ] . This will affect crop yields, leading to food shortages and high prices [ ?!?! ] . Mr Hensher said that even people who don’t practice bee-keeping can help sustain Canada’s population of pollinators ( which includes bees, wasps, butterflies, beetles, and flies ). Will self-imposing prohibition somehow mitigate the risk of so-called Bee Colony Collapse Disorder ?!?! Pollinator Best Management Practices ( PBMP ) are expected to minimize the imagined risk of golf courses to bees. PBMP will be a failure because it WILL NOT WORK. Bees will NOT be protected by PBMP because there are NO real risks on the golf course. The European Union [ EU ] recently placed a ban on all neonicotinoid pesticides, so perhaps this means hope for Canada as well. The majority of EU nations DO NOT want anti-pesticide prohibition. For example, Britain’s vote to leave the EU, Brexit, representS a VICTORY against bee conspiracy fanatжcs who conspire against neonicotinoid insecticides. Anti-neonicotinoid prohibition will NOT stop so-called Bee Colony Collapse Disorder. Based upon overwhelming scientific data, neonicotinoids harming bees is a MYTH, and prohibition against these insecticides is NOT necessary. It is perhaps worth pointing out that France prohibited against neonicotinoid insecticides in the 1990s, and it has seen NO marked reduction in bee colony collapse disorder. According to the results of the Syngenta field studies conducted in various different regions in France between 2005 and 2010, neonicotinoids are LOW RISK TO BEES. Additionally, neonicotinoid insecticides were still being used throughout the EU in 2013 … and yet, 2013 was the LOWEST European bee loss recorded since 2007. Furthermore, according to the European Food Safety Authority, the situation on honey bee colony mortality is BETTER THAN PREVIOUSLY EXPECTED. Consequently, EU government officials are THINKING TWICE before further imposing reckless anti-neonicotinoid prohibition. Dandelions are NOT an important food source for bees. The Weather Channel has concocted this story out of thin air. There is NO ONE at The Weather Channel who has ANY expertise on these issues. This recommendation, Don’t Mow Your Dandelions, is severely flawed and absolutely useless. Bee-keepers will continue losing their bees, regardless of dandelions. 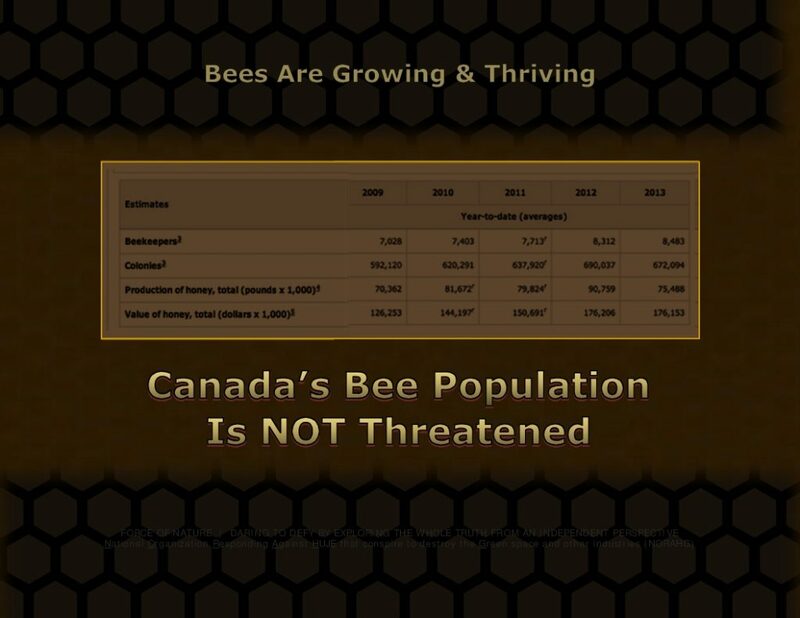 Why are only a few Ontario bee-keepers suffering devastating losses ?!?! Because these bee-keepers are actually INCOMPETENT. Just a few bee-keepers are actually losing their bees. The most likely cause of losses are the bee-keepers themselves. Observers have concluded that many bee-keepers have NO idea what they are doing, and are simply NOT SKILLED to raise bees. Some bee-keepers are killing their own bees over and over again. Otherwise, bees are GROWING AND THRIVING. There is NO bee-pocalypse because of neonicotinoid insecticide use. There are NO plummeting of bee numbers except for INCOMPETENT bee-keepers, who are losing their bees over and over again simply because they have NO idea what they are doing ! Bees are NOT being lost because of the use of insecticides. According to Mr Pierre Petelle, President of CropLife Canada, concerns about bee health and neonicotinoid insecticides is NOT warranted. In fact, bees are NOT dying off in the wake of neonicotinoid insecticide use, they are actually GROWING AND THRIVING. Why are a few bee-keepers losing their bees ?!?! The most likely cause of losses are the bee-keepers themselves. INCOMPETENT bee-keepers are killing their own hives. Observers have concluded that many bee-keepers have NO idea what they are doing, and are simply NOT skilled to raise bees. Bee-keepers are killing their own bees over and over again. Otherwise, bees are GROWING AND THRIVING. There is NO bee-pocalypse because of neonicotinoid insecticide use. There are NO plummeting of bee numbers. However, SOME bee-keepers are losing their bees over and over again simply because they are INCOMPETENT ! Bees are NOT being lost because of the agricultural use of insecticides. In the agriculture industry, neonicotinoid-treated seeds are safe and effective way to protect their crops while also minimizing exposures to beneficial insects like bees. Overall, so-called links and causes between bee colony collapse disorder and neonicotinoid insecticides are mere MYTHS ! When used properly, neonicotinoid insecticides will selectively and effectively control insect pests, but are completely safe for other non-target organisms ― they DO NOT harm bees, and have NO persistence beyond the season of use. Although some neonicotinoid insecticides can be toxic to bees upon direct contact ( as are many so-called green alternatives ), for decades, they have been used in a way that minimizes any potential direct exposure to bees, such as coated-seed treatment. This Best Management Practices ensure that the potential exposure to bees is at very low levels, far too low to cause harmful effects. Consequently, neonicotinoid insecticides will cause NO harm to bees because coated-seeds are buried in the soil, rendering the insecticides inaccessible to bees and other non-target organisms. Moreover, these insecticides systemically penetrate into the plant tissues where they remain inaccessible to bees. Bees do NOT consume plant tissues, and, therefore, are NOT harmed by neonicotinoid insecticides. There is NO neonicotinoid crisis ! Officially, the MAIN CAUSES of colony losses have been poor queens, Varroa mites, weak colonies, and weather conditions. Bee-keepers know full well that these are the PRIMARY PROBLEMS associated with bee losses, and NOT insecticides. In fact, some bee-keepers appear to be unable or unwilling to get their major pest problems under control, leading observers to conclude that bee-keepers who are losing their bees over and over again may NOT BE COMPETENT to handle their businesses, and may be WHOLY UNSUITED to be raising bees. The MYTH of disappearing bees is a political disease that can only be eradicated with the truth. Despite rigged testimonials and mock-photos, Integrated Pest Management ( IPM ) is futile nonsense and WILL NOT WORK ! Sadly, IPM is promoted by those who falsely allege success, and by those who are likely concocting lies, misconceptions, and deceptions for their own nefarious personal interests. Overall, IPM is a waste of time and money for golf courses. It is impossible for golf superintendents to ensure high-quality playing conditions and aesthetics by using IPM. Explore the link below entitled The Failure Of Integrated Pest Management. The owners of golf facilities must invest vast sums of money in order to their customers with high-quality playing conditions and aesthetics. To manage the playing conditions, golf facility owners invest vast sums of money in the acquisition of modern and educated golf course superintendents. Golf facility owners also invest vast sums of money for the continued education of their superintendents, through events organized by the golf industry’s leaders, such as educational conferences and shows, trade association memberships, and social events where knowledge is exchanged. What kind of knowledge is being imparted to golf superintendents ?!?! The golf industry’s leaders are telling superintendents that #@! !% futile & ineffectual Integrated Pest Management must be blindly adopted by the golf industry. Additionally, these leaders have made commitments to government officials that superintendents will reduce pesticide use by using Integrated Pest Management. Both superintendents and government officials are told that IPM-practices will reliably suppress pest populations to an acceptable level. This is WRONG ! As everyone in the golf industry knows, IPM DOES NOT WORK ! Without conventional pest control products, golf facilities become pest-infested and unplayable garbage dumps. It is impossible for superintendents to ensure high-quality playing conditions and aesthetics by relying upon #@! !% futile & ineffectual Integrated Pest Management. IPM is a dismal failure ! To compensate for the failure of IPM, golf industry’s leaders have embarked on a ludricous effort to reduce the expectations of golf customers by promoting low-quality & garbage-dump playing conditions, as well as inferior aesthetics. Unfortunately, it is NOT the role of golf industry’s leaders to dictate expectations to golf facility owners and their playing customers ! Perhaps it is time for the owners of golf facilities to re-evaluate the money they invest for the continued education of their superintendents. Explore the link below entitled Golf Course Owners & High-Quality Playing Conditions. The interpretations of Integrated Pest Management ( IPM ) provide NO benefit and NO scientific basis with the use of simplistic messages like « use least toxic pesticides as a last resort » and « apply it only as a last resort ». According to three scientific organizations ― Weed Science Society of America ( WSSA ), American Phytopathological Society ( APS ), and Plant-Insect Ecosystems Section of the Entomological Society of America ( P-IE ESA ) ― these messages are NOT the correct approaches to the pesticide component of an Integrated Pest Management ( IPM ) program. Explore the link below entitled Least Toxic Pesticides Applied As A Last Resort. Golf superintendents must STOP using unregistered concoctions under the false pretext that they are part of IPM-cultural-practices. Unregistered concoctions that contain compost tea, dish soap, vinegar, and phosphite are NOT legal, NOT valid, NOT effective, NOT economical, and NOT safer when compared to legally-registered conventional pest control products. Virtually all such concoctions are bogus, and often violate federal law. 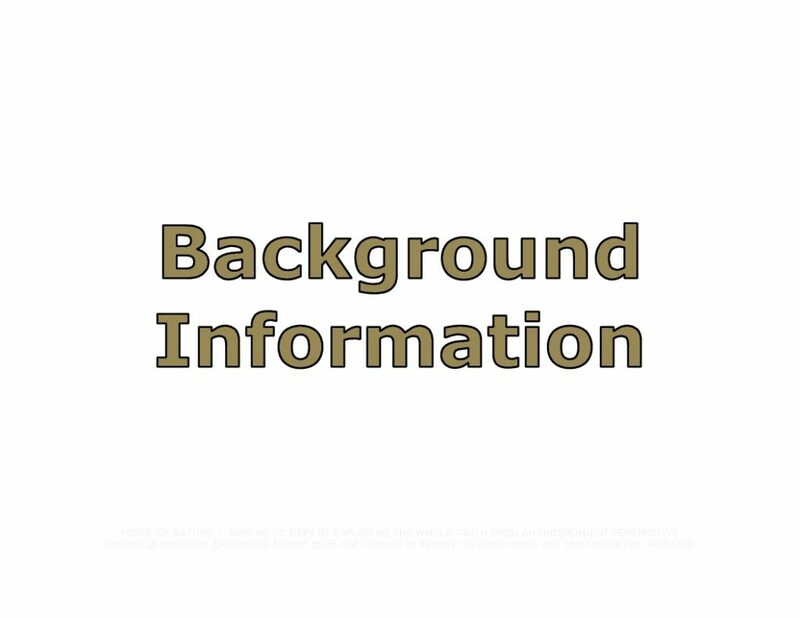 Moreover, it is a violation of federal law to recommend or sell or use unregistered concoctions. Additionally, preparing, storing, and using an unregistered concoction may pose risks to health and environment. Most often, an unregistered concoction is recommended by anonymous or non-expert authors who know nothing about pest control. Conventional products, such as 2,4-D and chlorothalonil, CANNOT be replaced by bogus, illegal, untested, unproven, and often dangerous concoctions ! Explore the link below entitled Violating Federal Law. Golf superintendents would be better-off validating the risk assessments of conventional pest control products, which indicate that they are scientifically-safe and will cause NO harm to players, workers, and the environment. Explore the link below entitled Pest Control Products Are Scientifically Safe. Golf superintendents often focus on the ineffectual IPM as the SOLUTION to their public affairs issues concerning the use of conventional pest control products. This is WRONG ! The golf industry must vigorously embark on a massive public relations campaign to discredit IPM-cultural-practices, declaring them as dismal failures and #@! !% futile nonsense. The golf industry must immediately STOP promoting inferior green alternative pesticides. All so-called alternatives to conventional products must be denounced as BOGUS. Green alternatives like nematodes, hydrogen peroxide, and compost tea DO NOT WORK, DO NOT CONTROL DAMAGING PESTS, and may even be DANGEROUS and ILLEGAL. Why are the golf industry’s researchers and educators wasting everyone’s time on Pollinator Best Management Practices ( PBMP ) when more critical issues need to be addressed ?!?! The golf industry is facing a looming shipwreck of annihilation ! These researchers and educators must pay more attention to the PRACTICAL EDUCATION of golf superintendents on issues such as reading a pesticide label. Superintendents are NO LONGER exempt from being horrifically fined whenever they defy the label directions for pest control products. Who cares about pollinators ?!?! Let’s worry about REAL issues concerning the golf industry. Are Linden Trees Toxic To Bumblebees ?!?! In 2013, less than 200 bee conspiracy fanatжcs gathered for a mock-funeral for a mere 50,000 bumblebees that died under some linden trees in a Target Store parking lot in the state of Oregon. The incident at the Target Store parking lot ― with bee deaths equivalent to one mere hive ― is alleged by bee conspiracy fanatжcs to supposedly be the largest bee kill on record. ( WRONG ! See later segment entitled The Biggest Killer Of Honeybees. ) Mock-eulogies were read by fanatжcs to commemorate the fallen bees, and the use of neonicotinoid insecticides was arbitrarily condemned. Is it possible that the linden trees were toxic to bumblebees ?!?! The incident at the Target Store parking lot was so mock-traumatizing for feeble-minded bee conspiracy fanatжcs that the state of Oregon decided to impose misguided and inappropriate restrictions against the use of neonicotinoid insecticides. The cowardly and inept Oregon Department of Agriculture decided to temporarily restrict the use of 18 products that contained the active ingredient dinotefuran, a neonicotinoid insecticide. Two years later, in 2015, when a total of 400 bumblebees were found dead in a park in Portland, Oregon ― once again at the foot of some linden trees ― the Oregon Department of Agriculture conducted a full-blown CSI-style investigation. [ ?!?! ] Is it possible that the linden trees were toxic to bumblebees ?!?! At the Target Store parking lot incident, the insecticide application DID NOT harm bees ! In this incident, the bee losses cannot be the direct result of an insecticide application performed in a negligent manner. It would have been impossible for an insecticide to have harmed the bees since it was applied several months earlier. Is it possible that the linden trees were toxic to bumblebees ?!?! Seemingly, bee-keepers are losing their bees over and over again. Why is this madness happening ?!?! Observers have concluded that many bee-keepers have NO idea what they are doing, and are simply NOT skilled to raise bees. Bee-keepers are killing their own bees over and over again. The alleged losses of bees are, in fact, the fault of these bee-keepers and their mis-management practices. The bee-keepers themselves are clearly responsible since they appear to be unable or unwilling or not skilled enough to mitigate the real issues that harm bees, such as starvation, transportation, weak colonies, fungal infections, and mite infestations. STARVATION is biggest single cause of bee losses ! Finally, bee-keepers prefer to remain UNPROFICIENT at bee-keeping, and expect the government to shower them with vast sums of unjustifiable compensation. Are Bee-Keepers Killing Millions Of Their Own Bees ?!?! What is one of the BIGGEST KILLERS of honeybees ?!?! How do bee-keepers kill millions of their own bees ?!?! TRUCK ACCIDENTS ! There IS a commercial honeybee crisis because of the carnage of truck accidents. How many honeybees die in truck accidents ?!?! NOT a few hundred. NOT 50,000, which is a whole hive. Up to 20 million honeybees have died in a single truck accident ! 20 million bee deaths is the largest bee kill on record by INEPT bee-keeper drivers ! Bee-keepers decimate millions and millions and millions of their own bees by driving their transport vehicles INEPTLY ! Clearly, many bee-keepers are NOT competent to drive trucks, just as many more are NOT competent to manage their hives. Bee-keepers are killing their own bees, and NOT neonicotinoid insecticides. So why are bee conspiracy fanatжcs ignoring truck accidents that are causing the deaths of tens of millions of bees ?!?! Whenever even a few hundred bees are found dead in the urban landscape, weak-minded bee conspiracy fanatжcs mock-react to bee losses as if they were the Armenian genocide. Bee conspiracy fanatжcs even create mock-funerals and mock-memorials for the bees. Are bee conspiracy fanatжcs only crying crocodile tears ?!?! Should there NOT be more focus on transportation safety ?!?! Should there NOT be more questions about the competence of bee-keepers as truck drivers ?!?! The risk assessment of conventional pest control products indicates that they are scientifically-safe, and, when used properly, WILL NOT cause harm to children, people, animals, or the environment ― there are NO harmful irreversible effects to health and environment. Not surprisingly, bee conspiracy fanatжcs have demonstrated that they are incapable of processing overwhelming scientific evidence. Should we trust these fanatжcs, who conveniently ignore scientific evidence, and attempt to impose their politicized-doctrines and twisted life-style choices against our society ?!? !